Premium Quality C9152-69007 Maintenance Kit (120V)(Includes Fusing Assembly 7 Feed/Separation Rollers 2 Pick-up Rollers & Transfer Roller) compatible with the HP LaserJet 9000/9040/9050/M9040/M9050. The use of compatible supplies does not void your printer warranty. 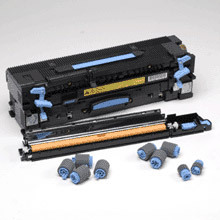 Premium Quality (120V)(Includes Fusing Assembly 7 Feed/Separation Rollers 2 Pick-up Rollers & Transfer Roller) Maintenance Kit compatible with the HP LaserJet 9000/9040/9050/M9040/M9050 is designed to meet or exceed the specifications of the original OEM manufactured cartridge.